Blessing of Might: Crossing over to the LIGHT side? 1) Dual spec is coming in the next patch. You're going to be picking up a secondary tree anyway if you can take the time to gear up NOW you'll beat the rampant inflation on your server for items.... I expect all titansteel items to rocket up in price with patch 3.1 These are horribly expensive already don't wait untill they rocket up to begining of WOTLK prices. 2) The top 100 arena teams are stuffed full of holy paladin / DPS combo. (Mostly DK, but others are there too). If you want to PvP and you're already RET - Holy is the way to go. Now don't misunderstand me, RET is my main spec I'm just setting up holy now as my off-spec for arena. I already tried a few games with crafted blue gear and it went about as well in 2's as RET in my current gear. I can only hope that better gear and more experience will enhance my 2's rating. In the mean time if anyone has links for good holy pvp guides link them up. 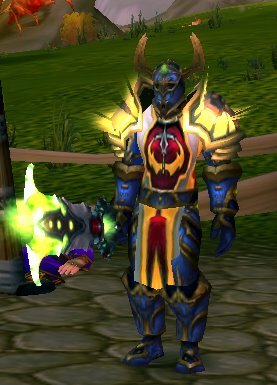 I'll let you know how things go next week as I plan to run both my 2's and 3's team as holy plus maybe even a VoA.... boy will I be pissed if a piece of ret gear finally drops and I"m sitting in holy spec. So whatever happened to your post about your guild tryouts? Did you guild not like it, I assume? Well it seems that once I joined the guild people pretty much left me alone. There's the occasional call for a premade or a slot for a 5 man or WG. Seems like everyone is doing their own thing for the most part - which is fine, but weird considering the reciutment process.